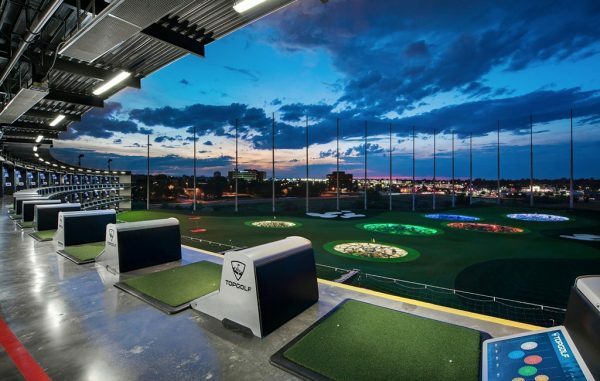 An example of a Topgolf tee line and outfield, this one in Centennial, Colorado. A Topgolf location planned in Henrico County just west of Scott’s Addition cleared its last major hurdle Tuesday night. The county’s board of supervisors unanimously approved a provisional use permit to allow two-dozen poles, some of which will rise 170 feet, to be erected on the site at 2308 Westwood Ave., where the Dallas-based company intends to build a multi-level driving range and entertainment complex. The poles would connect netting around the driving range to contain balls teed off from about 100 stacked, climate-controlled hitting bays out to a field lined with lighted targets. The nod from supervisors follows a prior approval of the plan of development from the county planning commission. Topgolf is under contract to purchase the 14-acre plot from a partnership between local developers Fountainhead Properties and Rebkee Co. The company would then only need building permits, pending finalized versions of the plans and construction drawings being submitted to the county, to begin work on the site. Company representatives have said it hopes to open the venue later this year or in early 2019. It will be the fast-growing company’s first location in the Richmond market, joining three others in Virginia and about three-dozen nationwide. Attorney Jim Theobald of Hirschler Fleischer is representing Topgolf before the county. The company has declined to comment on the project throughout the approval process. Locally-based Timmons Group is the engineer. Chicago-based Arco/Murray, which has experience building Topgolf facilities, is the general contractor. Breaking ground on the site could set off a race between Topgolf and its main competitor, the nascent New York-based Drive Shack, to see which can open in the Richmond market first. Drive Shack has been planning a similar $25 million facility on 13 acres off West Broad Street in Goochland County, just west of the Henrico line. It already has county approval for the plan and some site work appears to have begun. Drive Shack representatives have not returned messages in recent weeks seeking comment about the status of the project.